Blooming Magnolias signal the onset of Spring, my favourite season! I love the way the petals fall like confetti in the breeze! Painted in brush & palette knife in rich ochre tones. Ready to hang. Sides painted white. carefully packed, insured & tracked. 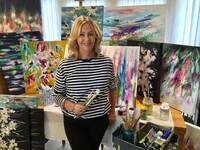 I am an artist based in Yorkshire and I love to create vibrant, uplifting paintings full of expression and atmosphere!. My main inspiration is the essence and beauty of nature, and I am fascinated by the vibrant colours and textures of constantly changing seasons. I try to capture luminosity and shadows in my work, drawing the viewer in to discover hidden gems within the canvas through layers of colour and texture. My paintings have found homes across Europe, South East Asia, and the USA.